Before you start installing plugins for your blog, it’s important for you to explore the Plugins page on your WordPress Dashboard and understand how to manage the plugins after you install them. Click the Installed Plugins link in the Plugins menu on your WordPress Dashboard to view the Plugins page. Drop-Ins: A very select few plugins actually have files that change the behavior of WordPress so substantially that it lets you know about it. 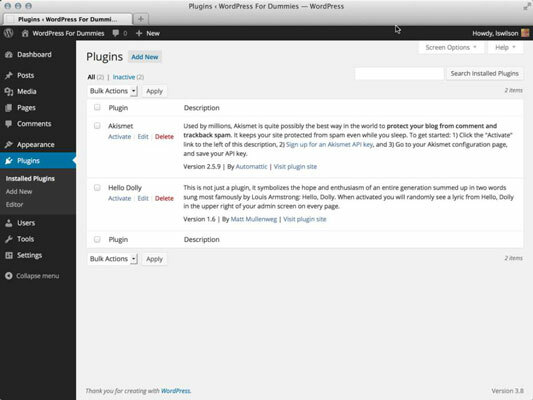 These plugins drop files into the wp-content directory that modify the core settings of WordPress. These files don’t show up in the main plugin listing because they typically belong to other plugins. The Drop-Ins link appears only if you have drop-in plugins installed. With a quick glance at the Plugins page, you can easily tell which plugins are active — and which aren’t — by the background color of each plugin listed. A blue background means that the plugin is not active. A white background means that the plugin is active.